January 13, 1937 — Rescuers moving injured passengers to wagons for the trip down the mountainside in the crash of a Boeing 247D on Iron Mountain near the Santa Clara Divide south of Newhall. Victims of the airplane crash near Newhall, Cal. 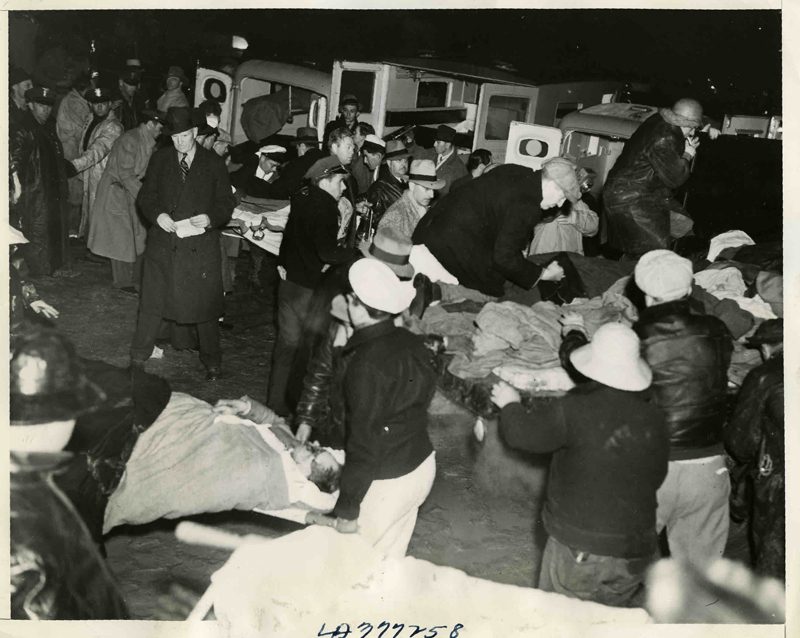 were transported to various hospitals, Jan. 13th, after having been marooned in the plane overnight. Photo shows rescue workers moving the injured down to wagons for the trip down the mountainside. Martin Johnson was one of the two fatally injured in the wreck. "James A. Braden, president of a Cleveland ink company, was crushed to death between two seats when the plane pancaked on a fog-shrouded mountainside 15 miles from Union Air Terminal, its destination at Burbank on a flight from Salt Lake City." [Quoting a Mr. Gardner] "I pulled open the cabin door. My eyes fell first on the dead man, James Braden. His body had fallen over Mrs. Osa Johnson and she was asking for someone to help lift him aside. She apparently was suffering from a broken leg." Braden is said to have died instantly. Martin Johnson, a famous adventurer and big-game hunter, did not. He lingered for a day before succumbing to his injuries. AL2072a: 9600 dpi jpeg from original print, collection of Alan Pollack. Second copy (LW3344) purchased 2018 by Leon Worden from Watson Archive.